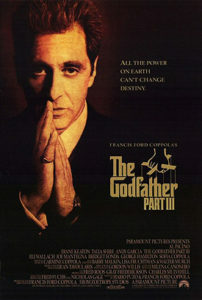 Considering all the drama behind the scenes, it’s a bit of a miracle that The Godfather Part III is even watchable. And to be fair, Coppola himself had created a legacy that was virtually impossible to live up to with the first two Godfather films. Still, it’s no accident that most of the nominations for Part III were in technical categories (all of which were richly deserved…this is a beautiful looking film).